I’d never seen the Grand Canyon close up. I flew over it once in a small plane – something like 30 years ago – but I’d never stood on the edge and gazed. Now I have. It was amazing. Overpowering. We drove up from the Phoenix area on the scenic route that goes through the red rock hills of Sedona, which are pretty amazing themselves. It was a bit of a whirlwind trip – we arrived in the evening on a Wednesday, so stuck to the fairly crowded viewing sites around the main visitor’s center for that evening. The next day, after an overnight in a motel in Williams, AZ, which prides itself on being a stop on the famous Route 66 highway, we went back and spent the full day exploring along the southern rim. We started by hiking down into the canyon on the Bright Angel trail. We did only a very small segment, just the first mile or so, because I kept reminding my sister and children that there was a very real possibility they would have to carry me out – an easy downhill makes for a very difficult, steep, upward climb on the return trip. Signs the park has posted included illustrations of people throwing up, overcome by the climb out. No one wanted that! This is a partial view of the part that we walked, along with a lot of other people. Mules had left a lot of clear signs that they also used the trail, which we carefully maneuvered around. This is more of the trail, showing where I called a halt – we stopped at the top of the extreme switchbacks that you see starting there. Overall, we spent about two hours going down and up. Enough to get a sense of the ambition and endurance of those who hike all the way down – it is a two day trip to get to the river and back out again by foot. There is a very helpful shuttle bus system set up along the rim that we used for the rest of the day. It is a hop-on-hop-off system stopping at a multitude of overlooks. The further out we got, the fewer the people, so there was a chance to stop and really look out over the canyon and think about how amazing nature’s processes are. We went full tourist at one point and faked some falling-from-the-edge shots to freak out the Grandmas on Facebook. Some grew a little weary of looking at scenic rocks. We met elk and learned that they eat pine needles. A hard way to make a living. But mostly we just looked, and looked, and looked. I just couldn’t have imagined how impressed I was going to be. The next morning we had to head back to Grandma’s, but we are already in family discussions about signing up for a hiking/rafting/mule trip in the future for the extended family. Sad as we were to leave the Grand Canyon, the return to the pool was very welcome. 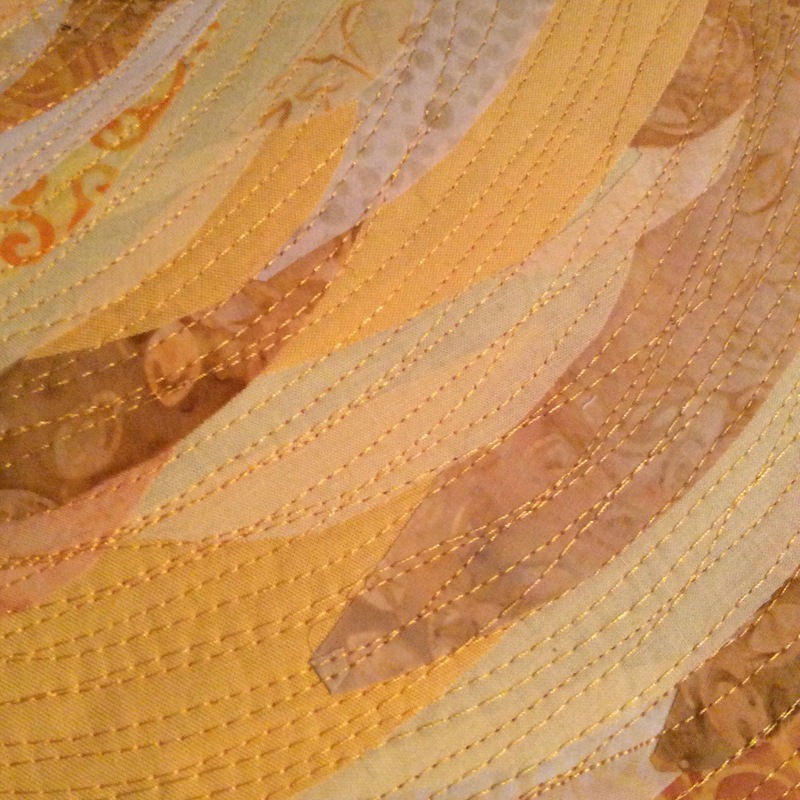 This was my first use of beads on a quilt. I’m really itching to embroider some more cacti as well after all that time in Arizona, so we’ll see where that takes me in the near future. It is definitely, finally, spring around here. Cherry blossoms and daffodils and all the weather extremes. The geese are flying away and the robins are coming back. It can be sunny on one side of the street and raining on the other side. Cats are lazing about in sunbeams. 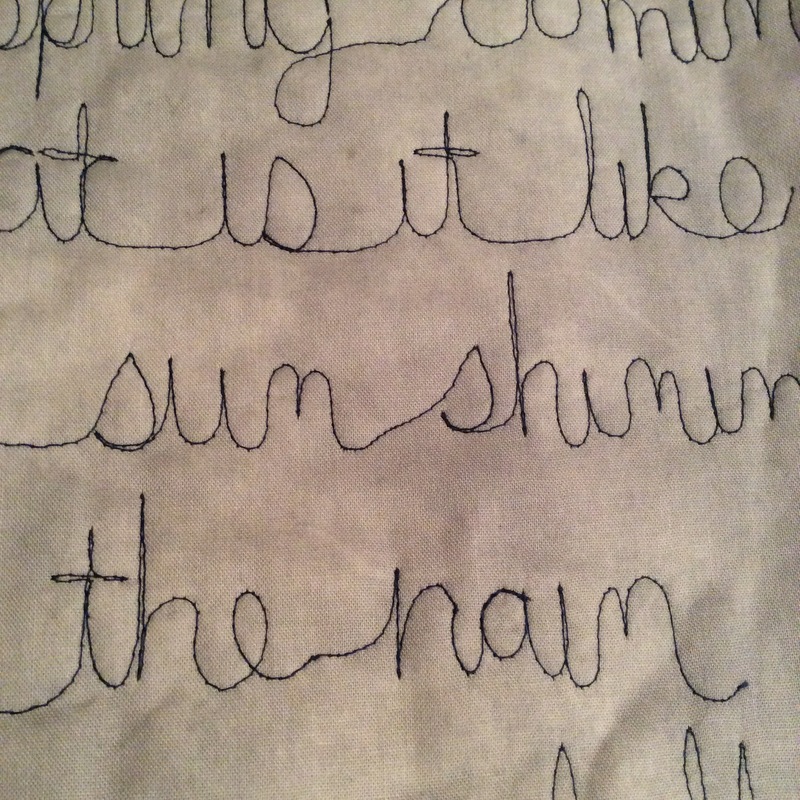 It seemed a good time to finish a mini quilt I started a while back as an experiment with writing in thread. It was semi-successful. I’d like to have the writing smaller next time, but it is legible! 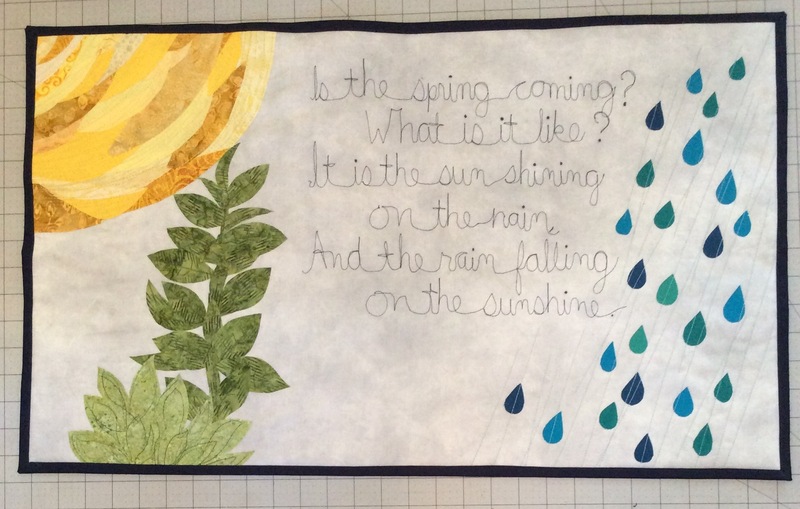 and I have a little bit of the spring to hang on a wall. The quote is from The Secret Garden by Frances Hodgson Burnett. 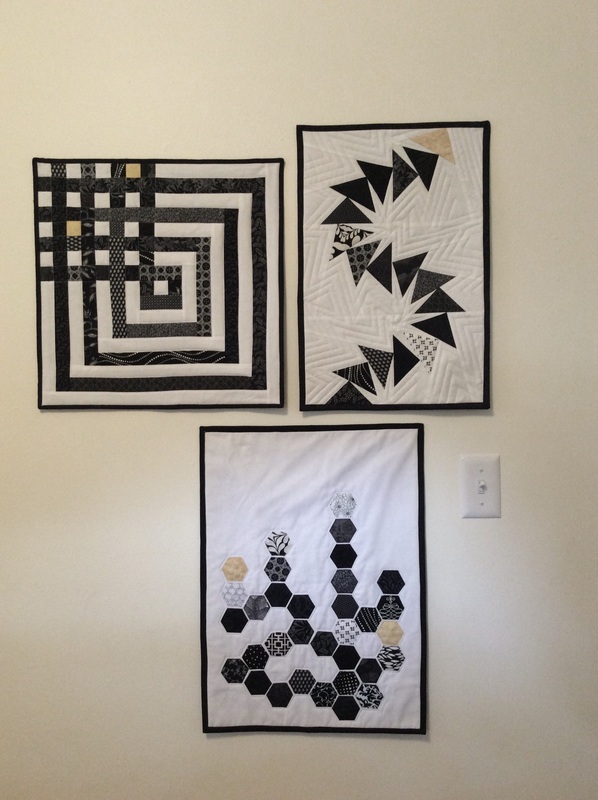 I was supposed to start my mom’s duvet cover first thing this morning, but I realized that I’d forgotten to pre-wash the fabric, so while that was in the machines, I finished up my black and white hexagon mini to add to my wall collage. I probably should have glued down the hexis, but I couldn’t find the right kind of glue and I was a little impatient, so I just pinned them. A couple shifted a little, but nothing too off. And I have never been a slave to perfection. 🙂 I’d never get any project done! 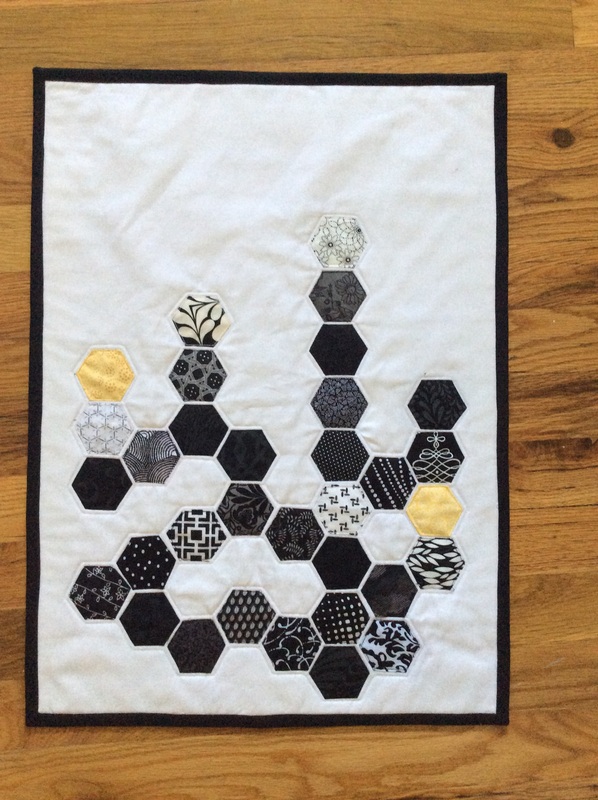 I quilted it minimally, just appliquéing the individual hexis and then stitching around the outline. It sort of reminds me of a molecule diagram. It joins the others on the wall. Now I need to decide on the next black and white project. My sister-in-law is getting married, and we get to go to Israel next week to go to the wedding! According to my Israeli husband, money is a more common gift than presents, but I couldn’t not make her something. 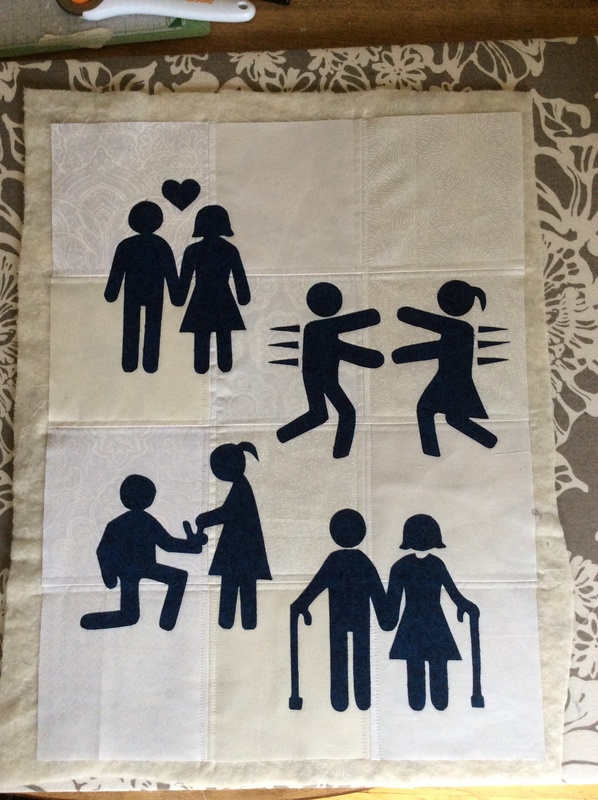 So, inspired by their wedding invitation, I am making a mini quilt for them. 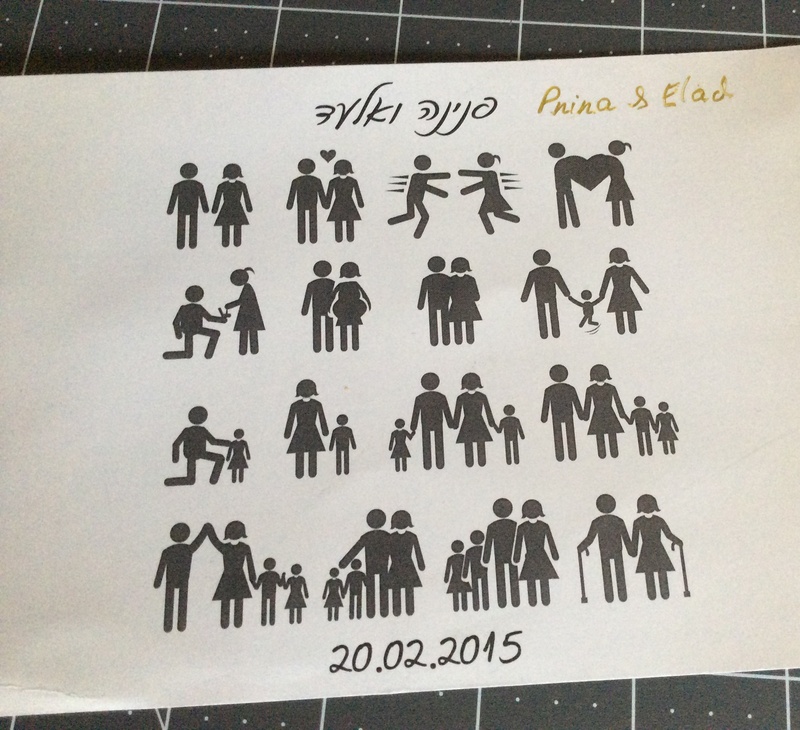 I scanned the invitation and my sister used her spiffy (technical term) software and cutting thingie (2nd technical term) to cut out patterns for me. 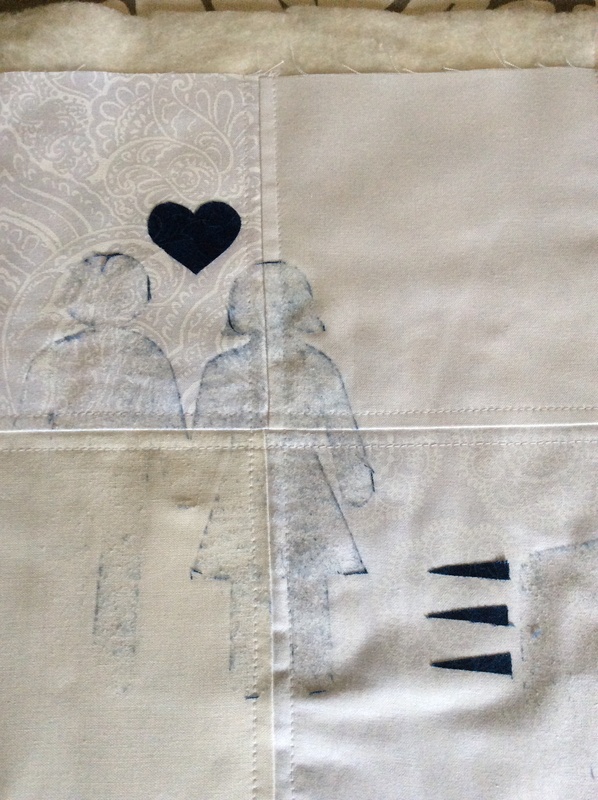 I then used those to trace on the paper backing of fusible web I’d ironed to fabric to make different silhouettes. Lots and lots of cutting around little corners came next. 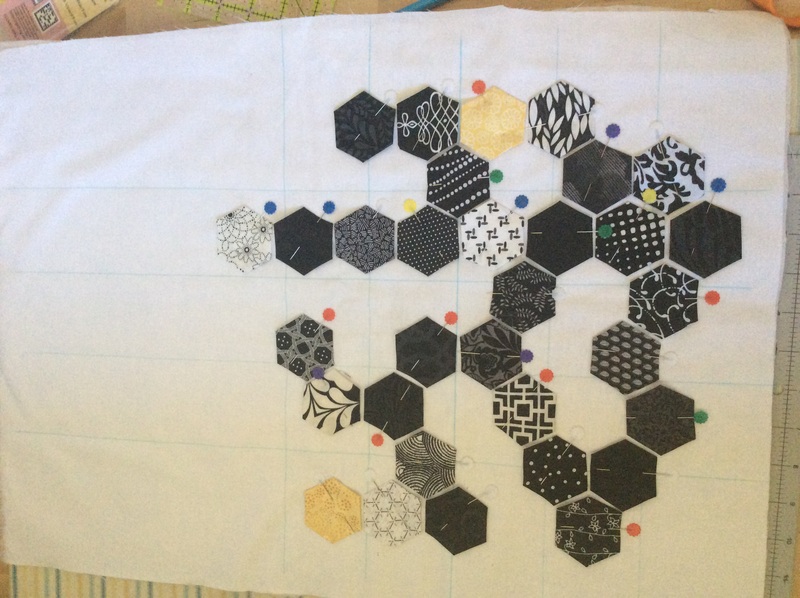 I quilted a background of squares from different white and ivory fabrics and ironed on the silhouettes and was so close to being done! 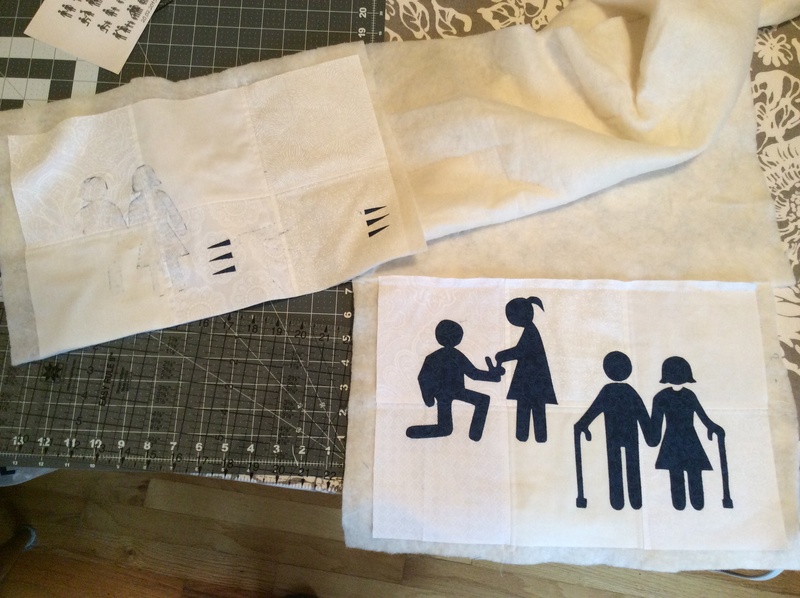 Just embroidering their names in English and Hebrew and the binding to do. This is actually a patterned blue fabric, but my camera makes it look black. Which is when I realized that I am an idiot. An idiot who should not be trusted with an iron. See, the thing about Hebrew is that it reads from right to left, unlike English. Which means that when I laid out the figures in a left to right pattern, as I read the invitation, I had the events out of order. The figures rushing to each other were representing the first meeting, which had to go before the falling in love. i tried to pry them up, but I’d done my ironing too well and it ripped the figures and left blue shadows and glue on the background. At this point, there was much swearing and stomping of feet and gnashing of teeth and then more swearing. 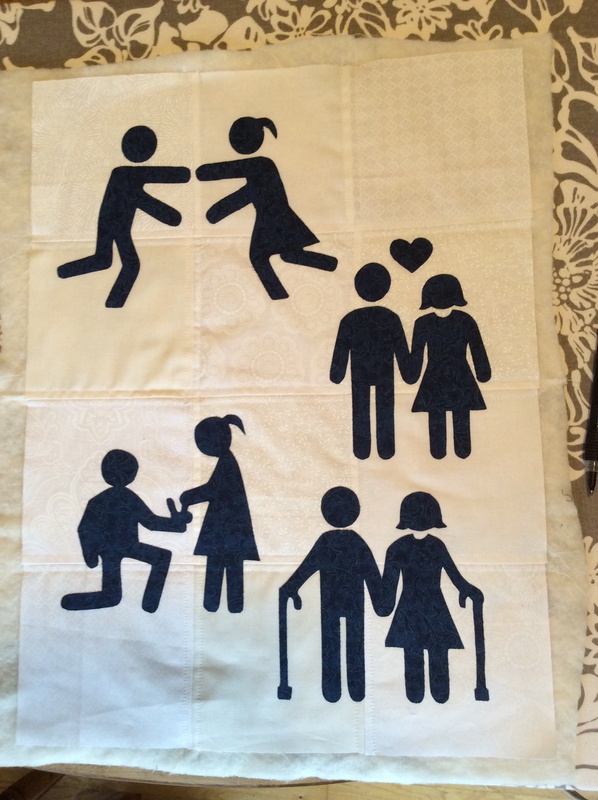 The redone and almost done wedding mini-quilt When I calmed down and became resigned, I performed an emergency amputation of the top half. I sewed on new batting, cut out new squares, sewed the new squares to the bottom half that I hadn’t wrecked, re-quilted, re-traced, re-cut, and after REALLY CAREFUL examination, re-ironed. I’m now back where I was an hour and a half ago, with just the embroidery and binding to go. Whew! I got another commission for a wall hanging, this time a family of dolphins. She wanted a mom, a teenager and twin youngsters to represent the family. I went colorful rather than black silhouette with these, using two different marbled fabrics. Then I made a tropical island with a sandy beach in the background and added some white caps. I quilted both the water and the sky with wavy criss crossing lines before adding the dolphins, one leaping from the water and the others swimming below. Next was outlining the dolphins, adding some dark blue (not black as it appears in the photo) underwater waves, a few clouds, and it was almost done. Just eye and mouth embroidery to do, and the binding to finish it all off. With the kids back to school today, I got a little sewing done. The Lover’s Knot block is up on the wall. I think It needs friends, however. More minis to be made. Lessons learned: I need to continue to work on precision in seam allowances, and when cutting strips for this block, cut how many background strips I think I’ll need and then double that amount! 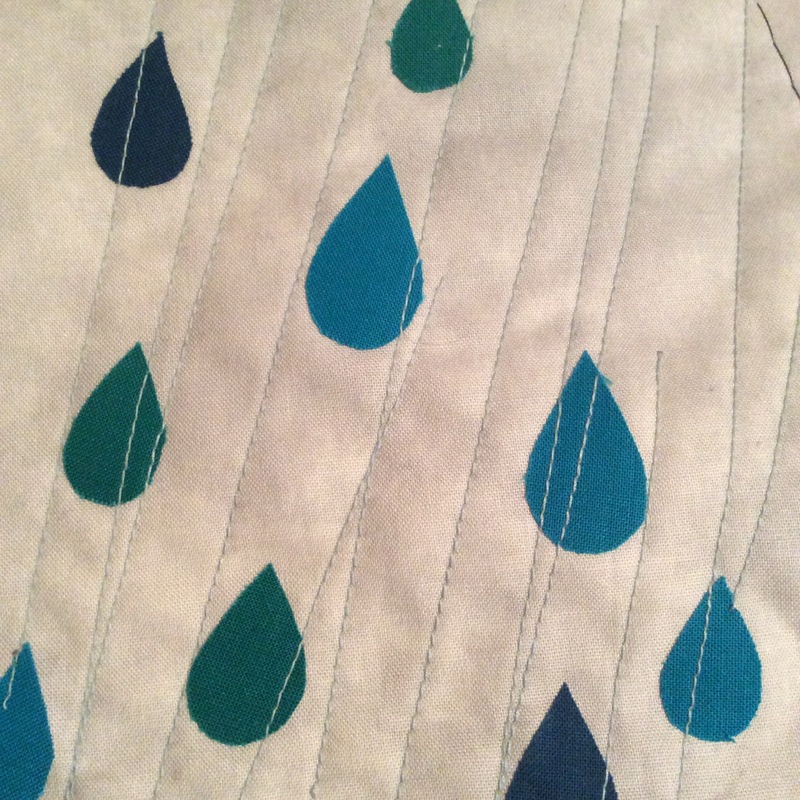 I quilted around the black lines with white, and then machine stitched the binding. When I’m not going to hand sew the binding on, I sew the binding to the front first, and then stitch in the ditch at the front binding edge, capturing the back edge of the binding. It looks better on the front that way, but if I don’t sew the binding on precisely in the beginning, I can sometimes not catch all of the edge when I go around the second time with the ditch stitching. I need to get better at judging the seam allowance I use when originally attaching the binding to give me enough to work with on the back. I only machine finish bindings on wall hangings so far, because the back isn’t ever going to show, so I can work to improve without too much consequence. All my blanket bindings I hand sew. I was going to say that it has been a productive day, but that would imply actually completing tasks from the to-do list, or even packing for the weekend away that starts in a about an hour. So instead I’ll say it was an activity filled day. Started off right with two 60% off coupons that let me buy a new cutting mat and a smaller square ruler to make things go more smoothly with planned projects. Such a deal with the discounts! Then I went online and bought this pattern for a lover’s knot block (though the designer calls it a carpenter’s square) to make into a mini quilt for our bedroom wall. Our room is black and white overall, with a little yellow and tan thrown in, and I want to make a few minis to cover a blank wall by the closet. 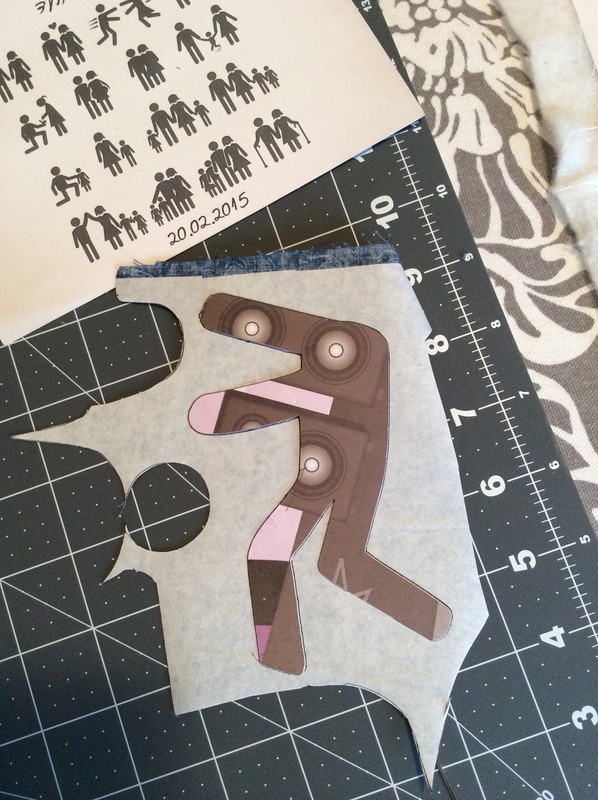 This block requires a lot of precision, in both cutting and sewing. Neither of those are my strongest skills, but working on this should help. I’m adding extra rows to make it a little bigger. The dramatic contrast is great, but if I do it again (and I plan to) I will put a color square in the very center. Yellow, perhaps. This is also giving me practice with my new Juki sewing machine. I’m crazy about the auto cut feature, but I keep forgetting I can use the foot pedal to use it. And the leg lever to lift the foot makes things so much faster. I can’t imagine I’ll ever get to use the rabbit speed though. Medium seems like I’m racing beyond my fingers as it is.